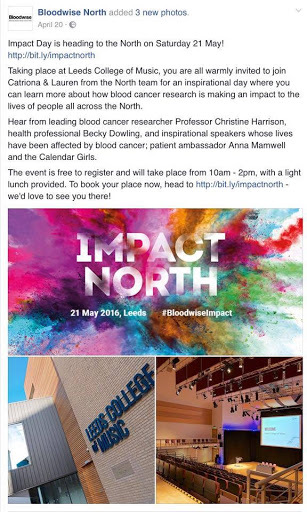 Bloodwise Impact Day! Sharing my Story! 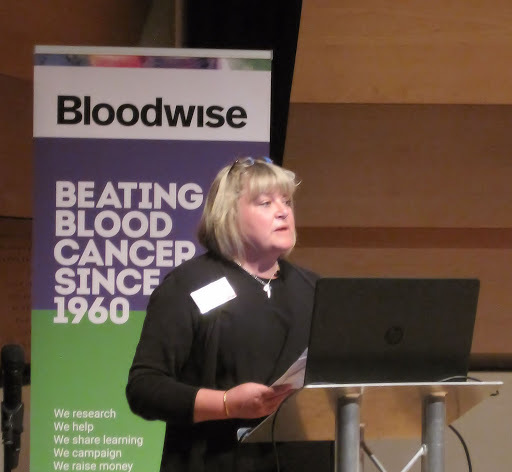 As part of my Bloodwise Ambassador role I was asked to talk about my experience of blood cancer. I immediately accepted even though I had never done anything like this before as I want to do what I can to help raise awareness etc. 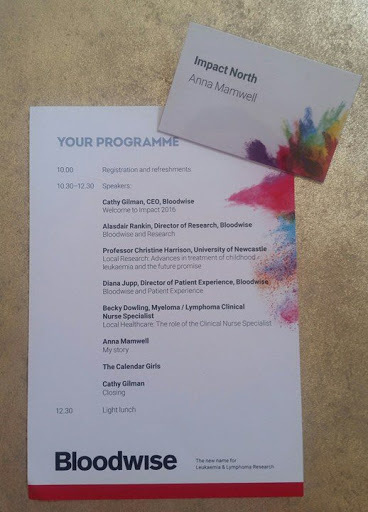 At first I didn’t know what to include as I only had a 15 minute slot and so much has happened to me since my diagnosis I couldn’t decide which aspect to focus on. 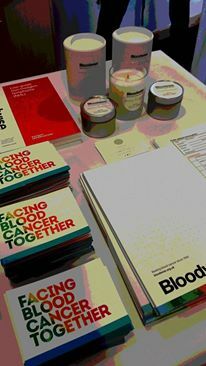 The way I was diagnosed and what could be learned from it and the impact of such a sudden diagnosis, the impact on my family especially my daughter and how we are dealing with it, the gruelling treatment and how it felt to spend 5 months in hospital ,living with blood cancer and how it feels to be in remission and regular hospital appointments, what I want to do with my future and how it has changed me. 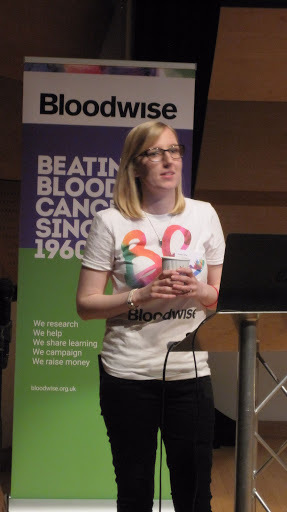 Eventually I decided to give a brief summary of what had happened to me and then focus on my Ambassador role, my blog and being positive about my future. 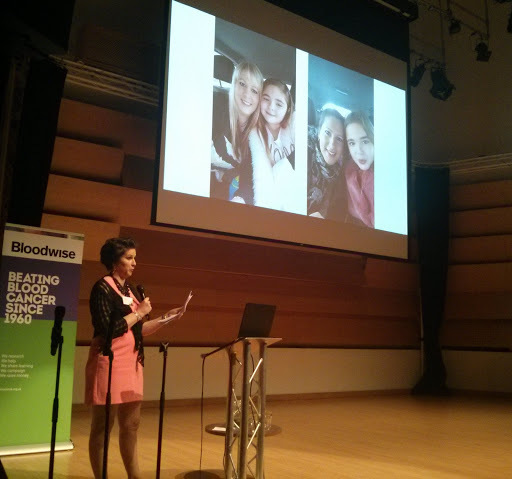 I put together some pictures to illustrate my experience and one in particular received some gasps from the audience. 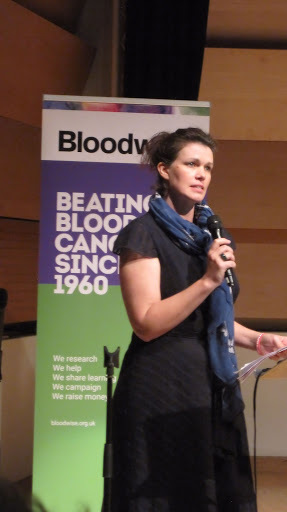 I also included a quote I have written to express how I feel about being in remission and was approached by John who had lost his son to Leukaemia. I was so touched and meeting him was great, they have done a lot to raise money for Bloodwise despite what they have been though. He loved my quote and asked if he could use it at an upcoming event he was speaking at. We are now in touch and I will be following his fundraising. 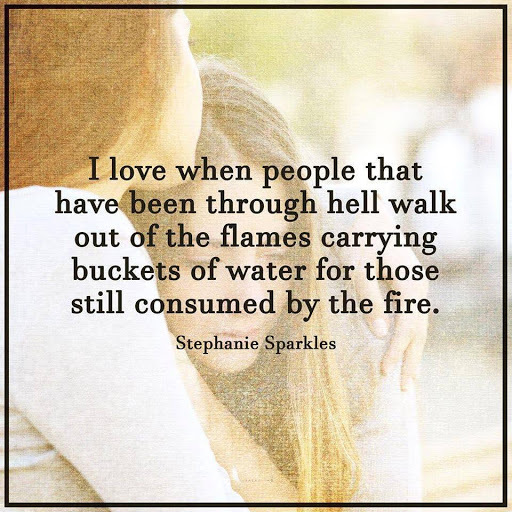 I saw this quote recently and it reminded me of him, his family, along with others I’ve met along the way who are so selfless and even though have been through hell still reach out to help others. 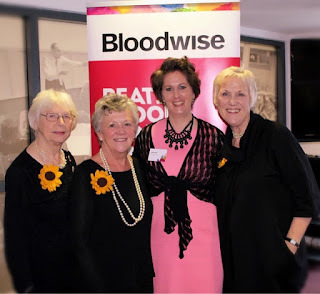 At the event I met some of the Bloodwise people who I have been corresponding with and other Ambassadors. 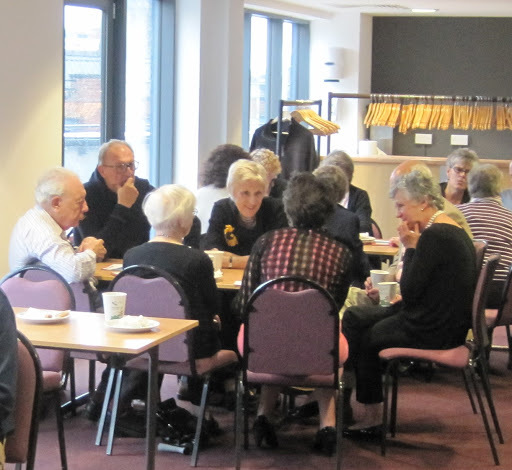 We were able to talk about our experiences which was great for me as it was one of the first times I’d met other patients like me. 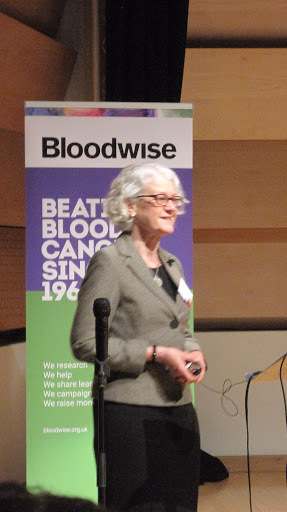 One lady in particular who has been in remission from AML for 8 years really helped my as she reassured me that my feelings will fade in time. I went home feeling less alone and a lot more positive. 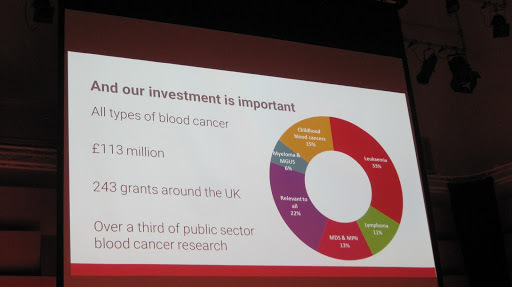 I found the presentations by Prof C Harrison and Alasdair Rankin really interesting and what I learnt will definitely help me understand the disease and help with the Ambassador role. Prof Harrison spoke about the genetics of the disease in a way that was easy to understand, as I had read a lot about this a lot of it made sense and my understanding improved. 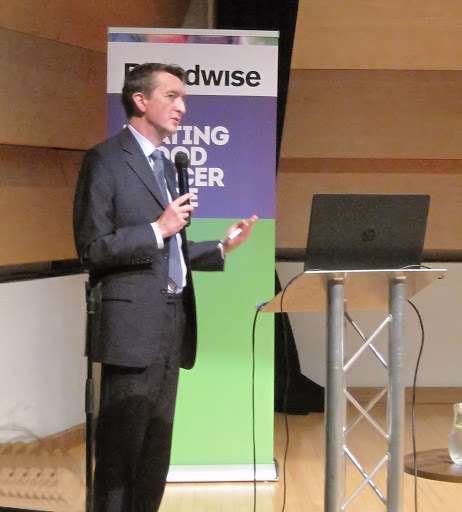 Alasdair Rankin who is the Director of Research spoke about what Bloodwise are currently doing and what their future plans are. I was able to chat to them, they were both very happy to answer my questions and were interested in my story. 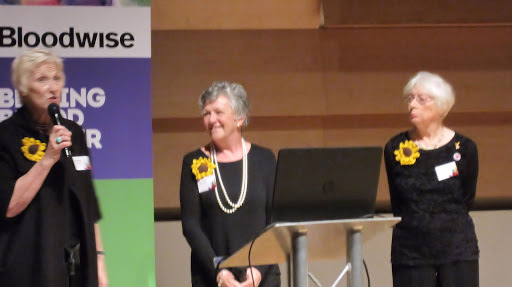 I was really touched when the Calendar girls who were attending asked me to join them for a chat as they were really impressed by the speech…it was the first time I had done anything like this and they have done lots of these things so I was relieved to hear this. We talked about what happened to me and I explained why I am driven to do what I am doing, their story and things they’ve done along the way. They are still amazed at how their story struck a chord and took off in the way that it has, to date they have raised around £4 million for Bloodwise. If they had given up and thought, as many of us do, ‘what can we do? we’re just a small group of people’ then all that money and awareness wouldn’t have been raised! We spoke about this and I told them that my feelings are that even though I can only do so much, if we all do our little bit it will add up to something really big! I had to ask them about Gary Barlow…I know, not very cool but I did. Their story has now been turned into a musical by him so they’ve met a few times and had nothing but good things to say about him. I am hoping to go an see the musical soon, I haven’t watched the film since I was diagnosed, so far I’ve avoided it. When I look back to when I first watched it little did I know that one day I would be fighting the disease! If you get the chance to go to one of these events next year I strongly recommend you go…maybe I will see you there next time?? Previous Post To grow or not to grow…that is the question! Shakespeare for Hair!! very nice article,thanks for this article.